Whether or not you dunk your donuts, there's a new option for the sweet treats in the Philadelphia area. After much planning - including a change in location - Donut Revolution just opened for business in Barrington, New Jersey (131 Clements Bridge Rd., 856-546-0900). Owner Tiffany Pesyna has set up shop a stone's throw off of Exit 29 of Route I-295 in Camden County, serving fresh "made without gluten" cake donuts alongside traditional ones. 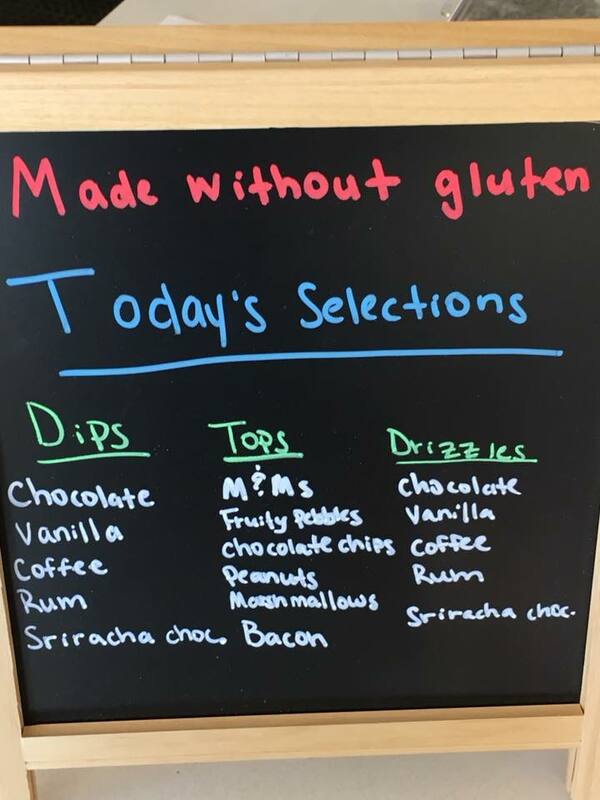 Pesyna explained that she doesn't call them "gluten free" only because she makes donuts with wheat flour in the same facility. However, she makes the without-gluten donuts first thing in the morning using a dedicated fryer and maintains a separate topping/dipping bar. When gluten-free customers order their made-to-order donuts, the staff washes their hands and changes their gloves before preparing them. 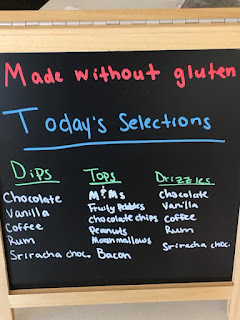 Customers can combine their favorite dips, toppings and drizzles: we preferred the vanilla over chocolate, but there's also coffee, rum and a daring sriracha chocolate dip. 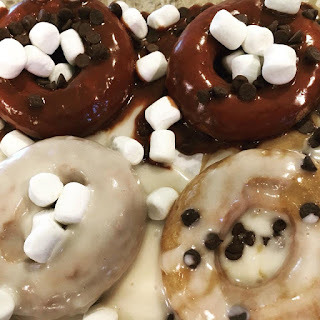 Toppings include M&Ms, Fruity Pebbles, chocolate chips, marshmallows and bacon, but if you want to "go naked" the plain donut was delicious on its own. Pesyna uses Bob's Red Mill gluten-free 1-to-1 baking flour as part of her recipe. Prices for these gourmet donuts are reasonable: $1.75 for one; $7 for a four-pack; and $19 per dozen.